After Building Cleaning Commercial & Domestic Fazakerley L10 | Quality Property Care Ltd.
Get decent commercial and residential after builders cleaning assistance as soon as possible! Call us on 0151 673 0008 phone number. Contact our kind customer support representatives and arrange a visitation by our experts for professional after builders cleaning! Kitchens also get a special treatment, with attention to stove tops and range hoods cleaning, backsplash and bench top cleaning. In case some plaster or paint has gotten on the cupboards, we wipe their fronts down, including a special finish to keep them safe from dirt, the exteriors of fridges are cleaned and polished if the finish allows it. We clean inside and outside of the microwave oven, with the sink left shining free of debris and junk. Again we pay attention to the finer details like door handles, on top of door frames, fixtures around the kitchen, fingerprints cleaned from light switches and doors frames, with floors mopped and vacuumed. All of the window sills are wiped down to ensure full cleaning. The company Quality Property Care Ltd. offers highly professional and very efficient home and commercial post-renovation cleaning services in Fazakerley L10 and the area. The cleaners are all very thoroughly assessed, vetted, trained and monitored. They use the latest cleaning technology and yet safe and very efficient (for the environment, you, your pets) cleaning solutions. The after builders cleaning service is very well structured and organised, which allows the team of completely insured cleaners to be as expedient as possible and to deep clean the premises and make them liveable as soon as possible after the builders have finished their work. 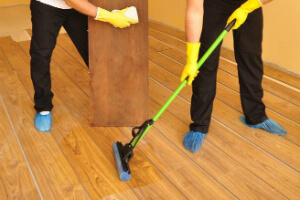 We can work only after construction work has completely ceased as any interference with our cleaning may lead to further contamination of the property and make our work harder. In terms of scheduling you can contact us, enjoy same day booking with minimal hours available, deposits or contracts required, no strings attached. Bath left shining, cleaned and rinsed, with shower recess scrubbed, all glasses and shower fittings cleaned, with special attention to the vanity and basin. Toilets are taken care of with proper scrubbing and disinfection including their base and around the outlet pipe and behind the tank, with a proper polish for all mirrors. We provide vacs for floor hoovering and mopping with an eye for the finer details like light switch and power socket cleaning. Tiles and fittings will be cleaned and left shining, waste bin cleaned from any paint and leftovers and left shining with additional attention to door frames bottom to top. You can easily book your after builders cleaning right away. Even same day service can be booked, if you are in a hurry. The after builders cleaning service is an hourly based service, so the price depends on the volume of the cleaning which needs to be done. Just makes sure that the builders are completely done with the work and call 0151 673 0008 or send an online booking form, and you will receive a written booking confirmation pretty soon.